The first thing that visitors of my blog will see is a banner advertising my latest releases and offers. I also advertise within my books themselves. You know, a simple, “If you liked this book, you may also enjoy the rest of this series, now available on Amazon” and a link. Finally, I promote my books by placing ads on various websites and social media. Typical modern marketing, you say? And yet, I recently discovered that all of these marketing techniques have been around at least since the Middle Ages, as seen in a post by Erik Kwakkel of Leiden University. 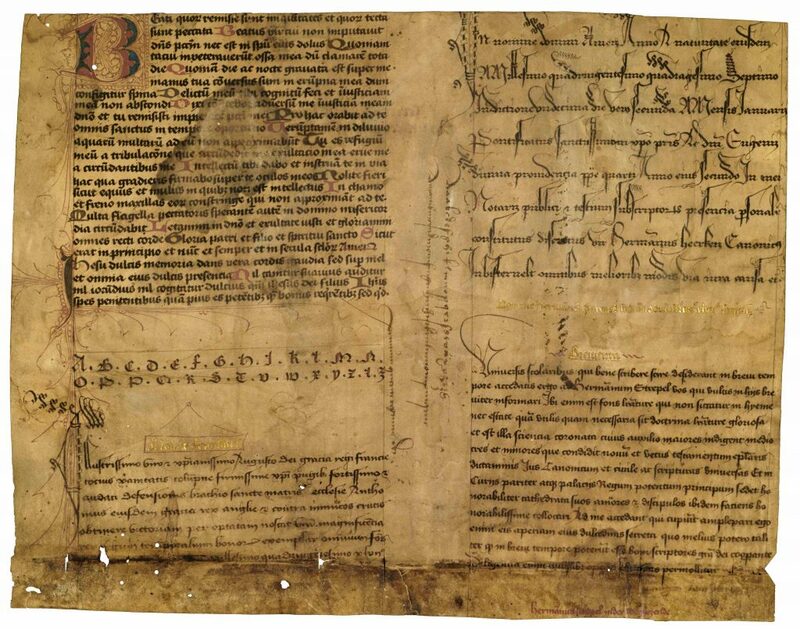 As Kwakel explains, the most common surviving book advertisement from medieval times is the so-called ‘advertisement sheet’ from medieval writing masters. Individuals who could write had a valuable gift, both intellectually and financially: they were able to duplicate any piece of writing, from short letters to full books; and they could do so for money. During the last three centuries of the Middle Ages (1200-1500) the demand for books rapidly increased, in part because of their cheaper production and the growing numbers of readers. Increased demand had a major impact on supply: urban professionals took over book production from the abbeys. They started to charge money, make a profit, and build the commercial book market we still have today. As more people became involved in commercial book production, competition among artisans increased. Starting in the thirteenth century, the book world became a marketplace where producers had to show what they had to offer. Encompassing over ten different scripts, each one more fancy than the next, the window display above, one of only ten or so that have survived, displays the expertise of the artisan to potential customers. The sheet was made by one Herman Strepel, who worked around the middle of the fifteenth century, perhaps in the German city of Münster. The samples are accompanied by their proper names, written in attractive letters of shiny gold. This vocabulary allowed the clientele to enter into a professional conversation with the scribe – using such term as ‘fracta’, ‘rotunda’ and ‘modus copiistarum’. The back of the advertisement sheet is blank, which means it was probably displayed in clear sight of potential customers, perhaps in a window or against a wall. A specimen from a German scribe says, ‘If you want to learn to write, do come in.’ It not only shows that artisans extended their services well beyond merely producing books, as they were professional trainers as well, but it also that such sheets were put on display right outside the door. If you like this copy of the Old Testament, I can also produce a book with the New Testament for you. This tempting offer has the feel of iTunes’s “Complete my album” or, more appropriately, the suggestions Amazon makes for further reading. The rarest kind of medieval advertisement is also the smallest. It measures only 80×146 mm, a little bigger than a credit card. As with historical artifacts in general, the smaller a bookish object is, the slimmer the chances that it survived. The small strip of paper seen below is an advertisement that promoted William Caxton’s Sarum Pie (‘Ordinale ad usum Sarum’), a religious book he printed in his Westminster shop in 1477. It is a very small flyer that was to be posted in the city, given the Latin closing remark ‘Supplico stet cedula’ (please leave this [strip] posted). It is the earliest printed advertisement in English and it has a lot to tell. late hym come to Westmonester in to the Almonesrye at the reed pole. Moreover, it stresses that the book has no typos (it is ‘well and truly correct’) and can be bought cheaply (‘and he shal have them good chepe’). 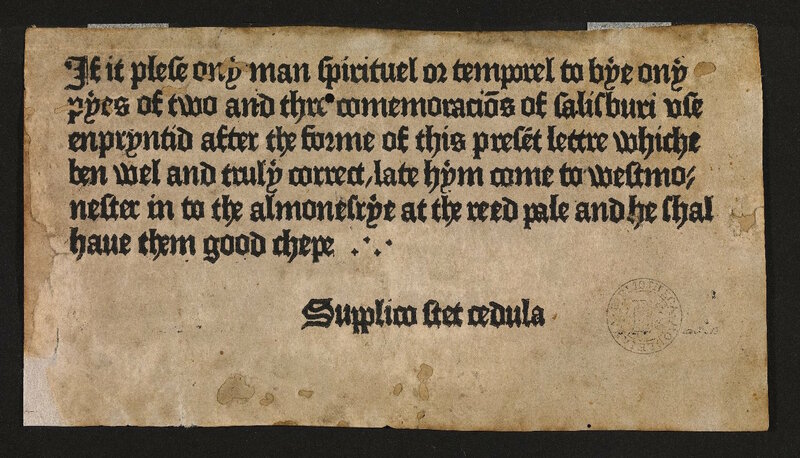 Just like the advertisement sheet of Herman Strepel, Caxton’s piece of paper comes with a great marketing trick: it states that the new publication is ‘emprynted after the forme of this present lettre’ (is printed in the same typeface as this very note). In other words, the reader can tell with his own eyes that it is worthwhile heading over to Caxton’s shop. Not much has changed in the world of marketing, then, in the past 600 years! I have Erik Kwakkel’s Medieval Books to thank for this fascinating insight into the world of Medieval spam. 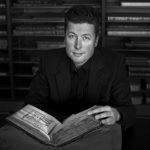 Erik Kwakkel is a book historian and lecturer at Leiden University. His blog brings the world of medieval manuscripts to life in a wonderful way. You can read the original post in its entirety on his blog. Fascinating! I honestly had no idea such a thing even existed. That’s hilarious! I love your “Complete my album” joke. For some reason I’d figured that the people who hand wrote books back in the day were in high demand — but clearly they needed to advertise just as much as we do! Oh, competition was killer back then. Literally. That’s why they’re all dead, apparently. Hahaha because the passage of several centuries had nothing to do with their deaths. Now I’m imagining secret 14th century writer/assassin guilds. Their preferred method of execution–the gift of a new bottle of ink, which is actually POISON!!! Dum dum dummmm. I know what it takes for someone to write a book. For 2016 I gave myself the task to hand write the entire New Testament. Filled 5 spiral notebooks. A page or two a day, some days more , some days did not write. Takes a lot of discipline and perseverance. I’d be honored. I’ll try to put something together and get back to you. I’d have thought that advertising in books would be a relatively modern practice. but clearly, it is not. I always find interesting posts here, Nicholas. Fascinating! Sort of like modern commercial artists showing their work! I hadn’t thought about book production prior to Gutenberg,except for monks’ reproduction of religious texts. I wonder how long it took to produce a hand lettered book and how much it would cost? I’m sure that information is available. I’ll let you know!